When I set off to write Red God Black God, I knew I was facing a massive challenge. Prior to this, I’d barely managed to complete a handful of short stories. The idea of completing a novel was a terrifying one and I really doubted whether I’d be able to sustain the plot, let alone cope with the myriad of further challenges I knew writing a novel would impose. 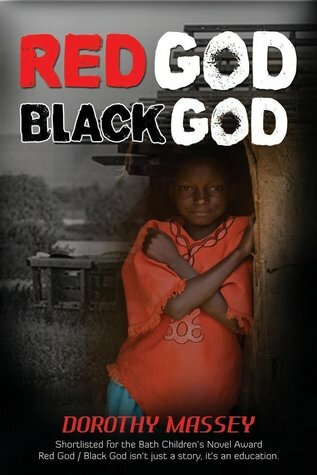 Red God Black God began as part of my MA in Creative Writing dissertation project, so I was actively encouraged to read books on the writing craft, which I did. Pamela Cleaver’s Writing a Children’s Book. The Writer’s Guide to Crafting Stories for Children by Nancy Lamb. But I’d set myself an even bigger challenge than writing my first novel. I’d only spent a total of ten days in the country about which I planned to write. I’d taken a field trip with accommodation in the Maasai Centre at Kimana, Kenya along with visits to local schools and amenities. This had provided the amazing opportunity to research directly, gathering first-hand information from native Kenyans. Particularly inspiring had been a visit to a Maasai village, including entrance to a Maasai hut, and a visit to Kimana High School, where I’d talked to pupils about their lives and ambitions. I’d kept a journal and taken photographs and also had access to photographs, journals and audio-visual resources created by fellow participants on the trip. I also had souvenirs (I’ll blog about how these found their way into the book later) and a couple of books bought in Nairobi airport for inspiration, Beneath the Rainbow: A Collection of Children’s Stories and Poems from Kenya Volumes 1 and 2. My biggest challenge as a Caucasian British writer was to accurately portray the lives, customs and values of the Maasai. Maasai values had resonated strongly with me. I shared their conviction in the importance of family, community and education. I wanted my novel to reflect the value of education, but at the same time manifest the value of tradition and community, aiming to dispel the myths, prejudices and stereotypes associated with Africa and the Maasai. A tall order, I knew. While in Kenya, I had bought a book entitled How to Write About Africa by Binyavanga Wainaina. At first the author’s satirical, sarcastic tone made me feel even less inclined to take on the challenge, but, keeping my motives strongly in mind as the novel developed, I found myself referring to the book for guidance and reassurance. autobiographical tales in which Tanzanian Maasai girls tell of their incredible struggle to gain an education. The fictional story of my lead character, Neema, arose as a result of reading their real-life accounts. The Warrior and The Moon; Spirit of the Maasai by Nick Would. The latter two undoubtedly helped in the character development of one of my secondary characters, Neema’s brother, Peter. Other children’s novels I read for different reasons. I reread Michael Morpurgo’s Kensuke’s Kingdom, marvelling at his ability to portray the exotic setting whilst creating memorable characters and a suspenseful plot. Part way through my first draft, I was stuck and decided to change from third to first person point of view. At this point I re-read parts of another novel which had left a strong impression on me as a reader, Suzanne Collins, The Hunger Games. Some books I sourced and read online in eBook format: A. C Hollis, The Maasai, their Language and Folklore and Naomi Kipury’s Oral Literature of the Maasai, in which I discovered the Legend of the Thunder Gods which eventually became an intrinsic part of Neema’s own story. There was one book I really wanted. I’d seen it at the airport in Nairobi, but it was pricey and beyond my budget. The Last of the Maasai by Mohammad Amin, Duncan Willett and John Eames. Eventually, many months after my return from Kenya, I ordered it. And it finally arrived, a pre-loved copy, with a tattered and torn sleeve. I’ve just gone and removed it from my bookshelf. Even now, looking at that front cover, from which three Maasai warriors gaze at me through eyes older than their years, I feel the familiar fascination, accompanied by the equally familiar longing to return to the country and community which inspired my book. Instead, I’ll indulge myself a little time, enjoy the stunning photographs, read some of the meticulously researched and expertly written text, and be thankful for books. And you can purchase Red God Black God here!